Average insurance rates for a 2009 Toyota Corolla are $1,148 a year for full coverage. Comprehensive insurance costs around $198 a year, collision insurance costs $328, and liability costs around $464. Buying a liability-only policy costs as low as $514 a year, and high-risk insurance costs $2,486 or more. Teen drivers receive the highest rates at up to $4,524 a year. Rate data is compiled from all 50 U.S. states and averaged for all 2009 Toyota Corolla models. Rates are based on a 40-year-old male driver, $500 comprehensive and collision deductibles, and a clean driving record. Remaining premium consists of UM/UIM coverage, Medical/PIP, and policy fees. For a middle-aged driver, prices range range from as low as $514 for a discount liability-only rate to a high of $2,486 for a high risk driver. These differences show why it is important for drivers to compare prices for a specific zip code and risk profile, instead of using price averages. Looking for better insurance rates for your Toyota Corolla? Shopping for the cheapest insurance online can be problematic for beginners to shopping for insurance online. Since there are so many choices, how can drivers even start to compare them all to find the best pricing? It’s a good idea to price shop coverage every six months because prices are usually higher with each renewal. Just because you had the best rates on Corolla insurance a year ago there is a good chance you can find better rates now. You can find a lot of wrong information about insurance online but I’m going to show you some great ideas on how to quit paying high insurance rates. If you have car insurance now, you will be able to lower your premiums substantially using this strategy. This information will familiarize you with how car insurance quotes work and some tips to save money. Although vehicle owners do need to understand the way companies market on the web and take advantage of how the system works. Insurance can cost an arm and a leg, but you may find discounts to help offset the cost. A few discounts will automatically apply at the time of purchase, but some must be requested specifically prior to receiving the credit. Air Bag Discount – Factory air bags can receive discounts of more than 20%. Multi-policy Discount – If you have multiple policies with the same company you may earn up to 20% off your total premium. Sign Early and Save – Select companies give a discount for signing up before your current expiration date. It can save you around 10%. Military Discounts – Having a deployed family member may qualify for rate reductions. It’s important to understand that most discounts do not apply to your bottom line cost. A few only apply to specific coverage prices like comp or med pay. So even though they make it sound like all the discounts add up to a free policy, companies don’t profit that way. Any qualifying discounts will cut your overall premium however. Check with every prospective company which discounts you may be entitled to. Some discounts might not apply in every state. When choosing coverage for your personal vehicles, there really is not a best way to insure your cars. Everyone’s situation is unique. For example, these questions could help you determine if you might need professional guidance. If you can’t answer these questions but a few of them apply, then you may want to think about talking to an insurance agent. If you don’t have a local agent, simply complete this short form. Allstate and Progressive constantly bombard you with ads on television and other media. All the companies make an identical promise that you can save if you switch your coverage to them. How does each company make almost identical claims? Insurance companies are able to cherry pick for the right customer that is profitable for them. A good example of a driver they prefer might be profiled as over the age of 50, is a homeowner, and has excellent credit. A customer who meets those qualifications is entitled to the best price and therefore will pay quite a bit less when switching companies. Potential customers who do not match this ideal profile must pay a more expensive rate and this can result in business going elsewhere. Company advertisements say “customers who switch” not “people who quote” save that much. This is how insurance companies can claim big savings. This illustrates why you absolutely need to compare many company’s rates. 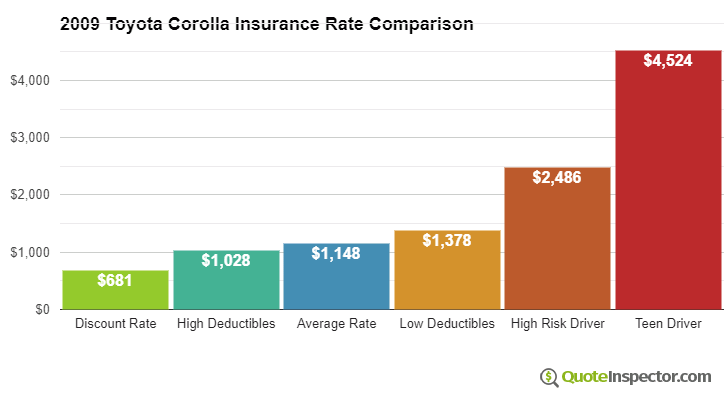 It’s not possible to predict which insurance companies will have the lowest Toyota Corolla insurance rates. Learning about specific coverages of your auto insurance policy can be of help when determining which coverages you need and proper limits and deductibles. Policy terminology can be ambiguous and nobody wants to actually read their policy. Collision – This coverage covers damage to your Corolla resulting from colliding with an object or car. You will need to pay your deductible then the remaining damage will be paid by your insurance company. Collision can pay for claims such as colliding with a tree, scraping a guard rail and rolling your car. Collision coverage makes up a good portion of your premium, so you might think about dropping it from vehicles that are 8 years or older. It’s also possible to bump up the deductible to get cheaper collision coverage. Auto liability – This coverage can cover injuries or damage you cause to a person or their property that is your fault. It protects you from legal claims by others. Liability doesn’t cover damage sustained by your vehicle in an accident. Coverage consists of three different limits, per person bodily injury, per accident bodily injury, and a property damage limit. You commonly see values of 50/100/50 which means a limit of $50,000 per injured person, a per accident bodily injury limit of $100,000, and $50,000 of coverage for damaged property. Alternatively, you may have a combined limit which combines the three limits into one amount without having the split limit caps. Liability coverage pays for claims such as emergency aid, attorney fees and medical expenses. The amount of liability coverage you purchase is up to you, but consider buying as large an amount as possible. Uninsured or underinsured coverage – This coverage provides protection from other drivers when they do not carry enough liability coverage. Covered claims include medical payments for you and your occupants as well as damage to your Toyota Corolla. Due to the fact that many drivers carry very low liability coverage limits, it doesn’t take a major accident to exceed their coverage limits. So UM/UIM coverage is very important. Normally these limits are set the same as your liablity limits. Comprehensive protection – Comprehensive insurance pays for damage OTHER than collision with another vehicle or object. You first have to pay a deductible and then insurance will cover the rest of the damage. Comprehensive insurance covers claims like damage from getting keyed, vandalism, a broken windshield and a tree branch falling on your vehicle. The most you’ll receive from a claim is the actual cash value, so if the vehicle’s value is low consider dropping full coverage. You just read a lot of information how to save on 2009 Toyota Corolla insurance. It’s most important to understand that the more rate comparisons you have, the higher the chance of saving money. Drivers may discover the lowest priced auto insurance comes from a small local company. When shopping online for auto insurance, it’s not a good idea to skimp on coverage in order to save money. Too many times, someone sacrificed collision coverage and found out when filing a claim that it was a big error on their part. Your aim should be to get the best coverage possible at an affordable rate while still protecting your assets. Low-cost insurance can be purchased both online in addition to many insurance agents, and you need to comparison shop both to have the best rate selection. There are still a few companies who do not provide online price quotes and many times these regional insurance providers only sell through independent insurance agents.